To install FlowerThinger, download the installer. Then run it. Some older system may not be able to run this game. 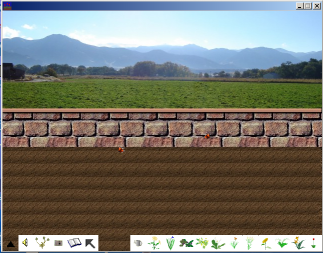 Left click on the flower of your choice, then left click in the garden to plant it. Left click on the watering can to water your flowers. place the head of the watering can over the flower you want to water and watch your flower grow faster. Tired of the watering can or flower sprout following your mouse around? Left click on the cursor button and the follower will go away. The small black arrow in the far left hand corner will hide all the icons. Left click it to hid and unhide the icons. Need help? Left click on the open book button to launch the program help. If you want to know what a button does, put your mouse over the button. A "tooltip" will appear that tells you what the button is. Open - open an existing garden (.gf). Cancel - cancels the menu. You can also cancel the menu by clicking somewhere other than the menu. Where did that plant come from? I sure didn't plant it. It's a weed. If you have weeds turned on, they will grow by themselves. There are thistles and dandylions. You can turn the weeds off or left click on them to pull them. It's a baby flower. If your garden has been running for a while, the flowers will seed down. Why do the blooms on my flowers disappear? After the flower blooms for a while, the bloom dies. Then the plant produces seeds, buds, and prepares to bloom again. See here for those who helped make this possible.